Merry Christmas and Happy New Year from Owl Moon! 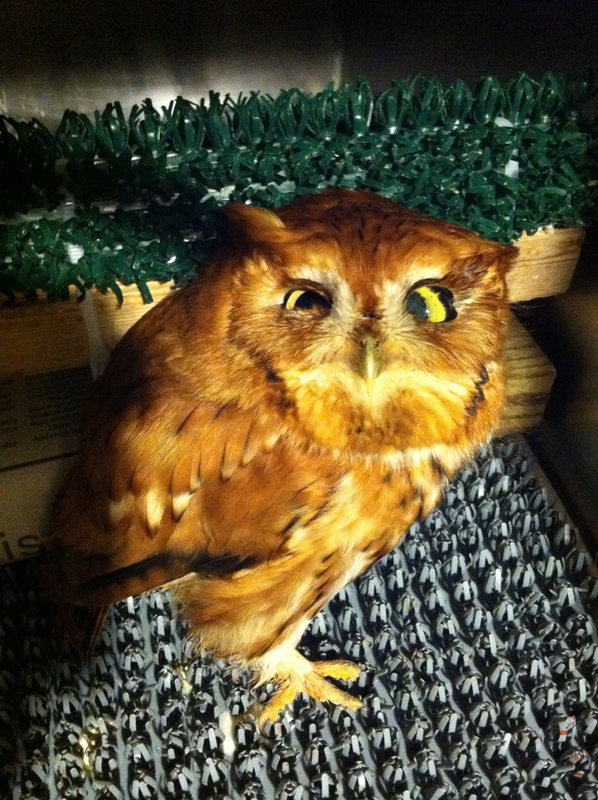 It was a quiet and peaceful holiday for us, filled with family, food, and five new Eastern Screech Owl patients. More about them shortly, but first I want to thank everyone who donated during our winter fundraiser. We have raised over $2500 to support the care of local birds of prey. I am so grateful to all of you, and I am sure the birds would be too if they understood how important it is for them. If you have not yet contributed but would like to, there are still a few calendars left. Please take the time to donate $25 now, and we will gladly send you a calendar (5 calendars for donations of $100!). The birds and I thank you. Eggnog Peers out from under a towel. This holiday we were able to give two birds the gift of a new start. I released “Egg Nog” the Barred Owl at dusk on Christmas Eve back in her home town of Potomac, MD. 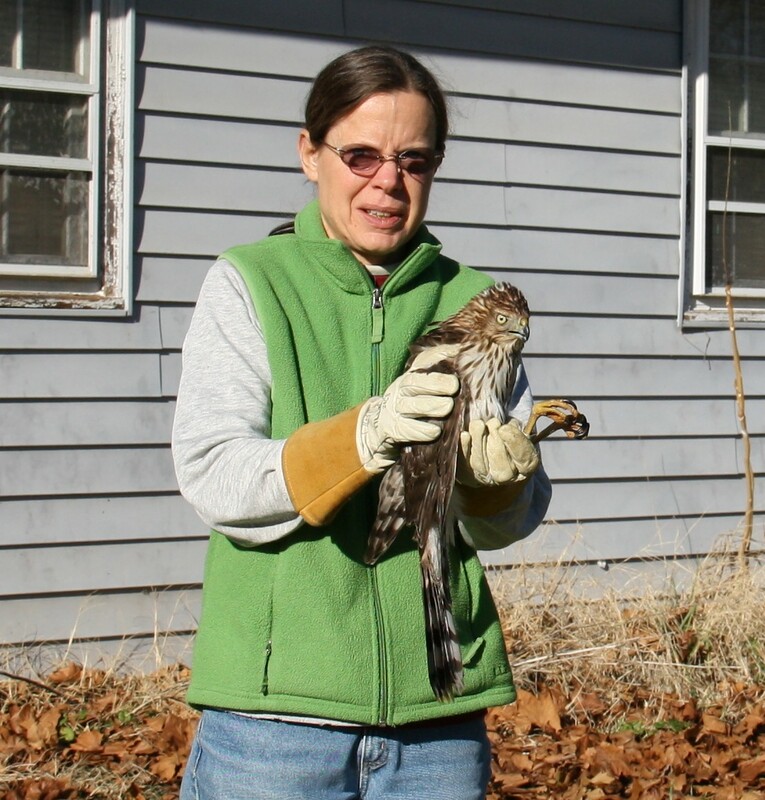 She and I were returning from Tri-State Bird Rescue and Research, where I had transferred her a week earlier for live prey testing. Egg Nog had recovered from head and eye trauma. Arturo had found her on November 21st along Falls Road in Potomac, MD, where she probably had an accident with a car. Fortunately, she regained vision in both eyes. Though her vision will never be quite as good as it was, she proved that she was capable of catching live prey. I was alone as I watched her fly off into winter woods. Suzanne holds Nutmeg just prior to her release. 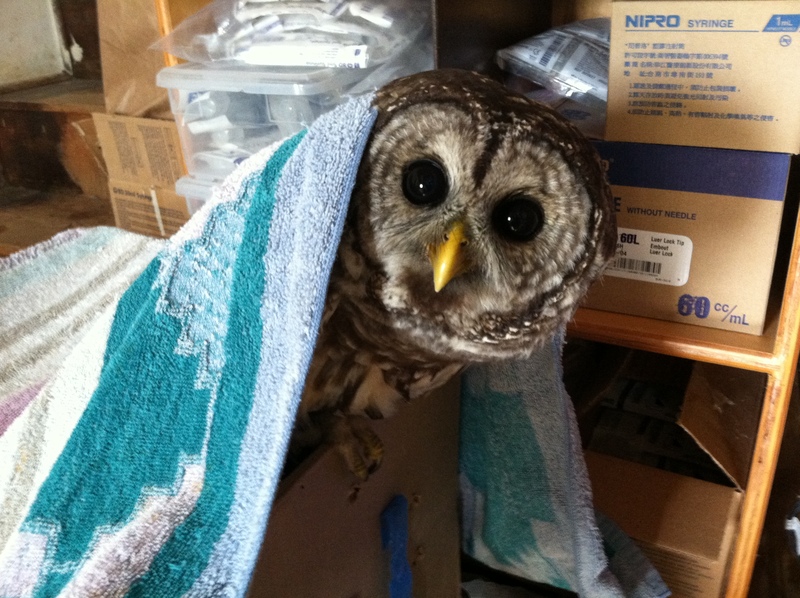 We released “Nutmeg” (pictured above) here at Owl Moon on Christmas morning. Ray found Nutmeg on November 8th in Thurmont, MD. 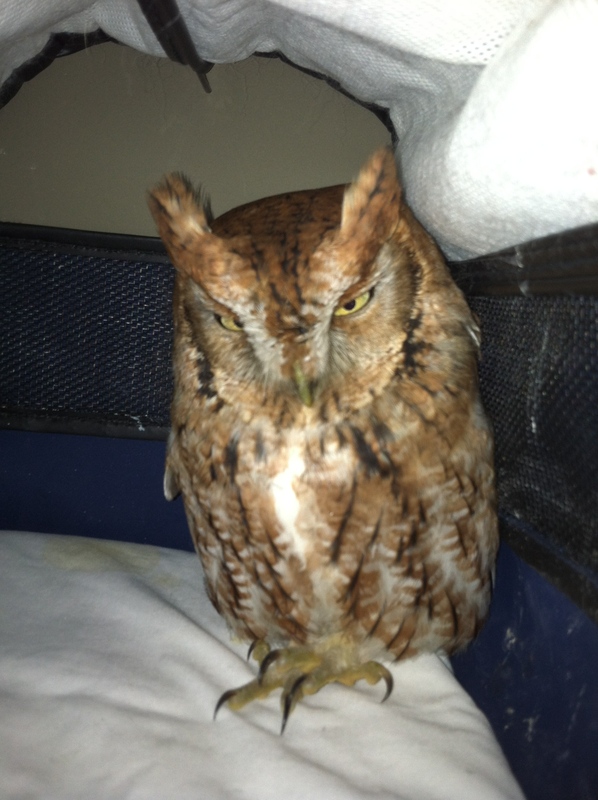 Frederick County Animal Control transferred her to Owl Moon on November 10th. We treated her for a long laceration along her back left shoulder. Like Egg Nog, she had probably been hit by a car. On the day of her release she was feisty and ready to go. The family and I took a break from the holiday festivities to bid her farewell. Nutmeg took off toward the forest and did not look back. 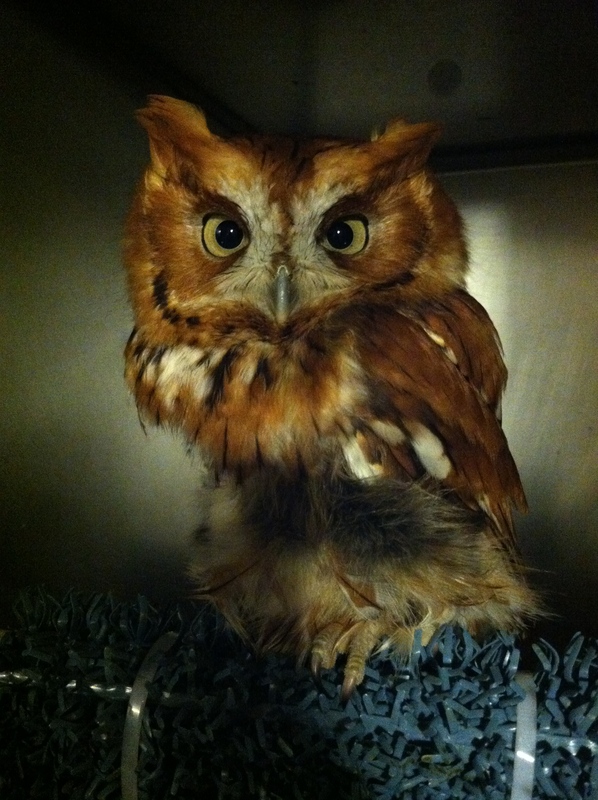 December has been the month of the Screech Owls. 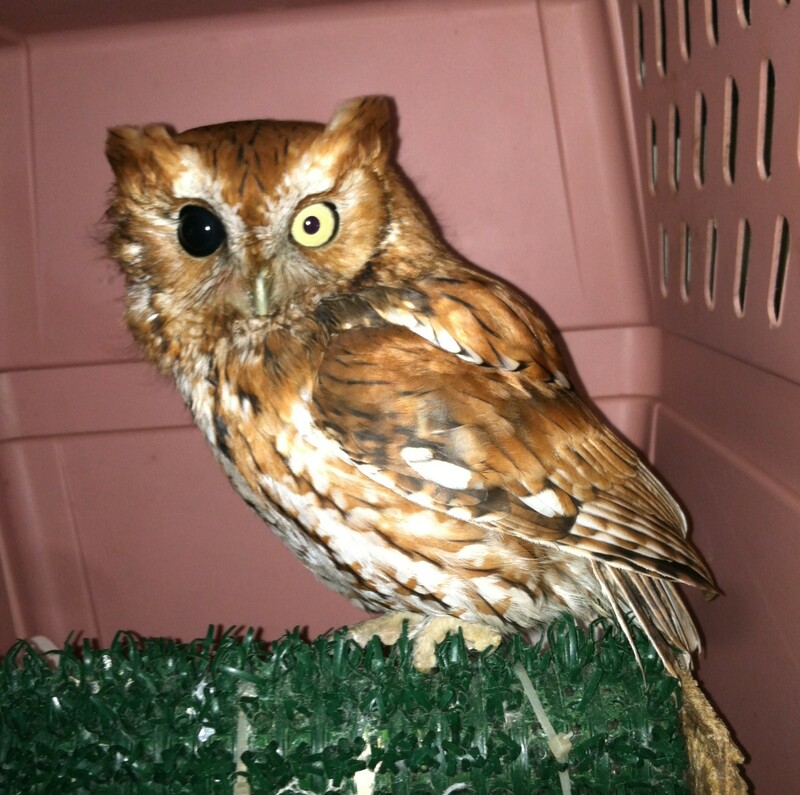 We currently have five red-phase Eastern Screech Owls: “Dora,” “Nora,” “Angora”, “Diego,” and “Pepe le Pew” (he has the perfume of a skunk!) All are victims of car accidents. Diego and Pepe have head and eye trauma. Both will probably will lose sight in one eye. However, they may still be released if they, like Egg Nog, can show they are capable of catching live prey. Dora and Nora have wing injuries. Dora’s is a fractured right humerus. 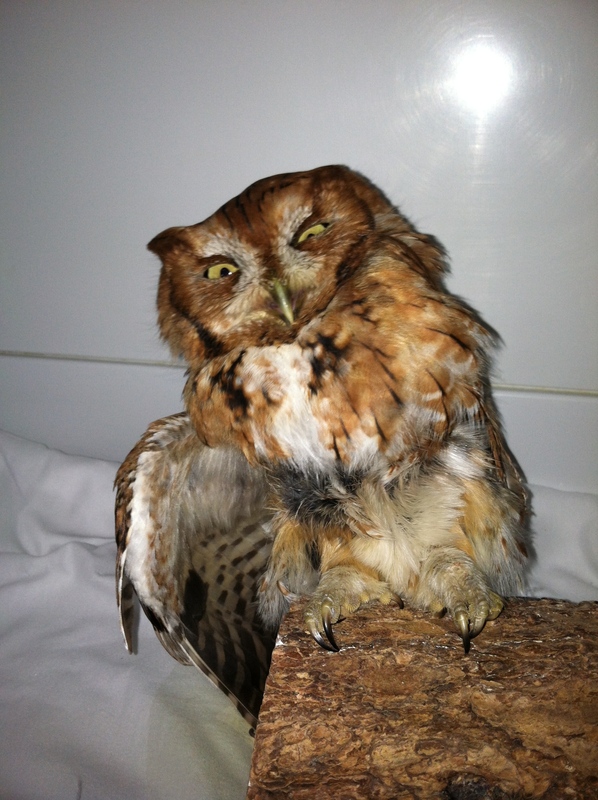 The bone was surgically repaired by Dr. Erica Miller at TriState Bird Rescue and Research Center on Christmas Eve. We are grateful to Dr. Miller for taking holiday time to help this bird. We are optimistic for a full recovery. Nora has a soft tissue injury in her left shoulder. If the injury does not involve nerve damage, we can hope for her full recovery, as well. We’ll know better in the next couple of weeks. Angora is the latest arriving on December 29th with head trauma. She is lucky that her eyes were spared serious damage, but too look at her you know she has a whopping headache. Her prognosis is good and we hope our medicine will make her feel better soon! Thank you to everyone who has helped Owl Moon this year. We wish everyone a peaceful, healthy, and happy 2014!